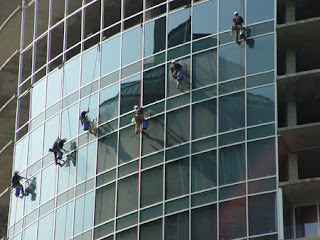 Our commercial window cleaning services in Atlanta, Georgia are professional and affordable. When comparing our professional window cleaning services to those of other window cleaners, our commercial window cleaning services are often considered to be superior by our clients. 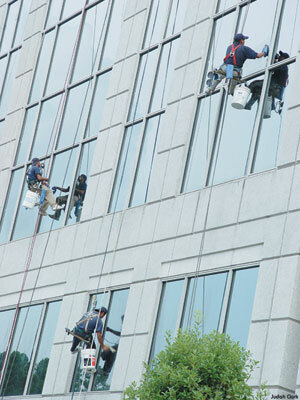 Presto Property Services provides interior and exterior, high and low-rise window cleaning services. Our window cleaning will leave the appearance of your windows better than you or your tenants can imagine. After our services are performed, customers often compliment on the improved working atmosphere generated from the enhanced clarity of the windows. At Presto Property Services, we have determined the right formula for keeping your windows clean and stain-free. Furthermore, your windows will remain cleaner longer; each time it rains, sticky residue will not be washed down from the ledges onto the window below. More information about the cause of glass stains can be found at www.IsYourBuildingGreen.com Or to download a brochure that explains the complicated matters of exterior building restoration and maintenance and how properties can save millions on implementing new and improved technology. When Presto provides regular maintenance for your building after performing our glass restoration services, you may be eligible for a lifetime warranty against future glass stains. Our warranty covers both products and labor. Presto Property Services uses the environmentally friendly window cleaning products made by Presto Restoration Products.